Time for another round of Yvo’s Shorties! This time around a most-anticipated 2019 release and a classic I had never heard about before ‘finding’ a copy out in the wild. 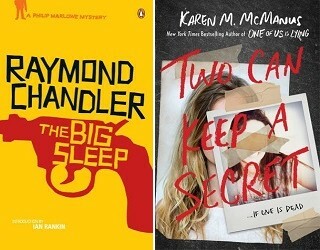 Two Can Keep A Secret by Karen M. McManus turned out to be a success, while The Big Sleep by Raymond Chandler failed to blow me away… Although I’m guessing I’m the wrong target group here despite my love for the genre. I have been looking forward to read more of Karen M. McManus ever since loving her debut in 2017. 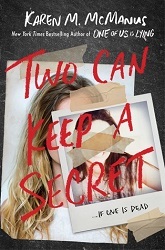 It’s easy to say that Two Can Keep A Secret was one of my most anticipated 2019 releases and this story definitely didn’t disappoint. While I think I found her debut to be slightly stronger, this doesn’t mean that I enjoyed this new story any less. I literally finished it in less than 24 hours and there is one thing for sure: she was able to surprise me completely with the ending. I had my suspicions, I had my doubts, but I’m so happy to admit I turned out to be wrong! I always love this feeling when it comes to murder mysteries, because it doesn’t happen all that often anymore. Two Can Keep A Secret is told from the POV of Ellery and Malcolm. Both play a key role in this story, the plot and the many twists, lies and secrets that surround Echo Ridge, and it has been interesting seeing their characters develop and react to the circumstances. Both characters are also easy to warm up to, along with Mia and Ezra as they try to figure out what is going on. The plot is well crafted and while a bit simple at times, I think the twists are well handled and work perfectly to put you on the wrong track. I had a blast reading this story and I can definitely recommend it to fans of the genre. Another bonus: the romance only plays a minimal role in Two Can Keep A Secret! Confession: I hadn’t heard of this author before and had no idea this was actually considered a noir classic when I first found my ‘abandoned book’ copy in Brussels during our Europe trip last year. But at least now I know right? I’ve been meaning to read more physical books and I decided to pick up The Big Sleep on a whim. Even though I’m a big crime and detective thriller fan, I do feel like I’m the wrong target group here. Why? I think Raymond Chandler‘s writing style and tone are mostly ment for the male audience and I wasn’t as charmed with it myself. The same goes for the sarcastic ‘humor’ used; I like my sarcasm, but in this case sadly it all fell flat for me. 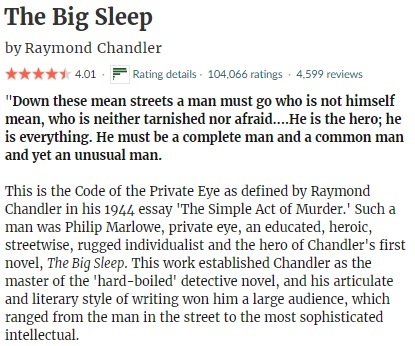 The slang and expressions are from the 1930s era and while it fits with the setting and the time The Big Sleep was written, it can get a bit tricky understanding every one of them for a non US English speaker. I can’t say I liked any of the characters and they lacked any real development for me. This story has a maffia/crime feel and there is a lot going on at once without anything happening at the same time. I know this sounds contradictive, but somehow it still applies here. I know I’m probably the wrong target group here and I know others have really enjoyed this classic, but I personally don’t think I will be meeting Philip Marlowe again any time soon. 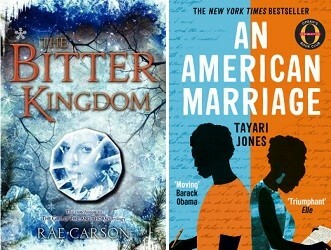 I’m currently reading The Bitter Kingdom by Rae Carson so I can cross off another series while the things that happened in book are still sort of fresh in my mind. I’m also starting An American Marriage by Tayari Jones. I’ve been wanting to read it ever since it came out last year, so I was stoked when I was able to get an ARC of of this new version with a new cover coming out next month. I’m looking forward to finally read it! wo Can Keep A Secret was one of my most anticipated 2019 releases and this story definitely didn’t disappoint. While I think I found her debut to be slightly stronger, this doesn’t mean that I enjoyed this new story any less. I literally finished it in less than 24 hours and there is one thing for sure: she was able to surprise me completely with the ending. I had my suspicions, I had my doubts, but I’m so happy to admit I turned out to be wrong! I always love this feeling when it comes to murder mysteries, because it doesn’t happen all that often anymore. Another bonus: the romance only plays a minimal role in Two Can Keep A Secret! Even though I’m a big crime and detective thriller fan, I do feel like I’m the wrong target group here. Why? I think Raymond Chandler‘s writing style and tone are mostly ment for the male audience and I wasn’t as charmed with it myself. The same goes for the sarcastic ‘humor’ used; I like my sarcasm, but in this case sadly it all fell flat for me. I sure wish I would have been able to read it twenty years ago… Still, A Wrinkle In Time made a more than solid impression on me as an adult. I definitely understand the love for this story now! The writing style draws you right in and is very engaging and timeless. Even though the story was first published over 50 years ago, it will still be easy for children and adults alike to connect to this story. The plot itself is simple, but the setting in space and the time warps give the story a little something extra. I think everybody knows by now I’m a huge fan of Amy Harmon‘s books and her newest story has only reconfirmed these feelings. It’s impressive how different and unique each story is! What The Wind Knows is one of my new favorites with a fascinating historical setting in the 1920s Ireland, a time travel twist and a romance and family story you cannot help but fall in love with. The writing and plot development are sublime, the chapters alternating between the journal entries written by Thomas and Anne’s POV as things happen to her. Beautifully crafted and simply splendid! Where Amanda Lovelace‘s poetry might lack in style, complexity and elaboration, it outshines other poetry with its overwhelming and powerful emotions and strong messages. It’s actually combination of the simplicity of the words and the overpowering message they are able to communicate that turns her work into something special for me. I admire her for being able to speak this openly about the past and what happened to her. What made The Mermaid’s Voice Returns In This One stand out from the others is that Amanda Lovelace mixes fantasy with reality this time, using not only poems but also short paragraphs with odes to famous stories by other authors. And that is not all: in the final part of this bundle you can find thirteen guest poems by other poetry writers with a similar topic mixed in between her work. An original touch and something I could really appreciate. This was such an adorable read! I knew I was probably going to like this one as I like both author’s books, but this was definitely a winner for me. The writing, the main characters, the geeky elements (go The Sims and Harry Potter references! )… It was just all so so cute and fluffy and I had a wonderful time reading it despite a few cliches and other minor complaints that fade away compared to the rest of the story. I’m probably picking up my next NG ARC up after finishing my current reads. I can’t wait to read Until The Day I Die by Emily Carpenter, especially since I loved reading The Weight Of Lies last year. 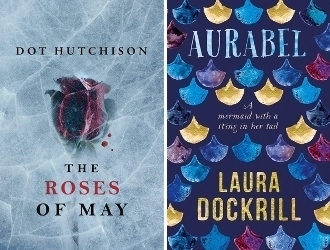 I also want to read Ivory And Bone by Julie Eshbaugh and Wintergirls by Laurie Halse Anderson as my next backlist titles. My new TBR jar pick is still Be Frank With Me by Julia Claiborne Johnson. 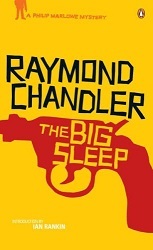 I’ve been neglecting those poor physical copies on my shelves, so I decided to pick up noir classic The Big Sleep by Raymond Chandler on a whim. I’m ashamed to admit I hadn’t heard of the author before, but so far my first experience with his work has been interesting. I’m also reading one of my 2019 most anticipated releases Two Can Keep A Secret by Karen M. McManus. So far I’m flying through it! This story is part sci-fi, part psychology, part murder mystery, part family drama and part romantic fiction. There are a lot of different elements involved in The Psychology Of Time Travel, and somehow they all manage to work together and create a very fascinating debut. The complex plot will have you on your toes as you try to fit everything together, but only in the most positive way. It was interesting to see the different characters evolve over time and the psychology behind time travel is simply intriguing. I loved the details of the time traveler’s slang as well! This book definitely left a mark and will stay with me for quite some time. Exquisite is an excellent psychological thriller that will give you all the feels and will most definitely manage to shock you before you reach the final page. Simply exquisite and absolutely worth the read if you enjoy the genre! I’m definitely kicking myself for waiting this long to finally read it. It might have to do with the fact I was in the mood for a feel-good story, but I enjoyed my time with this story so much better than I thought I would. This story is cute, fluffy, quirky, geeky and has unique characters and that #ownvoices element that seems to be so popular right now. Yay for etnic diversity and interesting characters that represent a different culture in a realistic way! The characters are what made this story into a success for me and I loved reading about Dimple and Rishi’s story. The coding, the comic art, the geeky elements in general… This was just quirky heaven for me. What seems to be a historical paranormal fiction story about witches, turns out to be a mostly historical and romantic family drama with only a hint of the supernatural. This lack of a role of the witches, familiars and the witch trials was rather a disappointment for me and not something I expected when I picked up my copy of The Familiars. The fact that Fleetwood was rather dull and lacked a proper personality didn’t really help either, as the story evolved around her and it was hard to keep myself invested in a story when I couldn’t care about the main characters. Having cheating and a love triangle involved didn’t really help either… But if you enjoy character driven and more romantic and family focused historical fiction stories, you will probably end up enjoying it better than I did. I can’t deny that the idea behind this story is fascinating and shows a lot of promise, but I don’t think the execution lived up to expectations. The paranormal element of How To Experience Death For Beginners, by far the most interesting aspect of this story, lacked development for me as instead we get an uncomfortable mix of different and sometimes cliche elements that fail to combine into a coherent plot. The lack of credibility, the main characters, the way difficult topics were handled… Sadly this story just didn’t work for me. Even though The Shattering didn’t turn out to be a big hit for me, I’m still glad I finally picked it up. This probably has a lot to do with the setting, since I hardly ever seem to read books set in New Zealand. It also doubles as a negative though, because I would have loved to see more local culture and descriptions included. As it is, The Shattering feels more like a melting pot filled to the brim with different story elements and bits and pieces, making each feel superficial and underdeveloped. The story itself has a lot of potential, with the paranormal aspect, the secrets of Summerton and three different POVs to follow. But with so many different elements distracting you, the story didn’t come out as strong as I thought it would be. I’m definitely picking up What The Wind Knows by Amy Harmon next as she is one of my favorite authors and I’m dying to read her newest story. I’m also planning on making good to my promise to read more Agatha Christie and pick up the second Hercule Poirot book The Murder On The Links. And to further reduce my ARC pile, I’m also picking up An American Marriage by Tayari Jones soon (I’m not sure which cover I prefer…) And I have a new TBR jar pick: Be Frank With Me by Julia Claiborne Johnson. I’m currently still reading the Reading Alley ARC The Last Valentine by Felix Alexander, which is turning out to be another interesting read. I don’t have much left, so I will most likely finish it today… And as soon as I do, I will continue with another ARC: Feel Me Fall by James Morris. I’ve read a few of his stories in the past and enjoyed them, so I’m definitely looking forward to this one! The blurb sounds just too good. I’ve also finally picked up my copy of Little Women by Louisa May Alcott again, and this time I’m going to stop procrastinating and just finish this classic. Maybe the cold weather will set the right atmosphere? As soon as I read the blurb I just knew I had to read this story. I have a weak spot for serial killer thrillers and the one described in Be My Killer sounded like a true ‘beauty’. And I was right, because the murders were both gruesome, twisted and disturbing in general. Suspense and plot twists are stacked up to dangerous heights until you find yourself unable to stop reading until you reach the last page… I didn’t like every character and had some minor problems with the credibility, but that didn’t stop me from reaching the last page in record time. And what a ride! One Of Us Is Lying ended up being even better than I thought it would be. 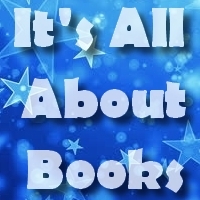 Sure, the characters started out as cliches, but they were really easy to connect to and ended up growing into something so much more… The writing style is highly enjoyable and only adds to the fast pace of this story. The plot twists are excellent as well and all in all I had a great time reading it. More than recommended! Those who follow my blog probably know I’m a big fan of the mystery/thriller genre, and this sequel is without doubt another winner. From the enjoyable writing style, fast pace and misleading plot twists to the fact that Secrets Of The Dead has a serial killer; this book just ticked all the right boxes for me. I love it when a psychological thriller is actually able to surprise me! Because I was definitely in the dark about the ‘who’ until the moment it was all revealed. I’ve actually just realized this is book number 600! since I started this blog! I still can’t wrap my head around that number… And such a wonderful story to reach that mark with as well. Words In Deep Blue has the most gorgeous cover and is a YA contemporary romance story that partly takes place in a book shop. I love the idea behind the Letter Library and all those letters being included in between chapters were a really nice touch. I literally flew through the pages and finished it in less than a day and really enjoyed it, although the love triangle did become a bit annoying. The first title I’m going to pick up as soon as I finish my current ARCs is Love, & You, a poetry bundle written by fellow book blogger (ChicNerdReads) Gretchen Gomez. I’ve heard so many wonderful things about it and I can’t wait to finally read it myself! I also need to read both The Gypsy Moth Summer by Julia Fierro and The Breakdown by B.A. Paris as their publish dates are coming closer. I’m looking forward to both! And the fantasy ARC Heartborn by Terry Maggert is also still on my list. 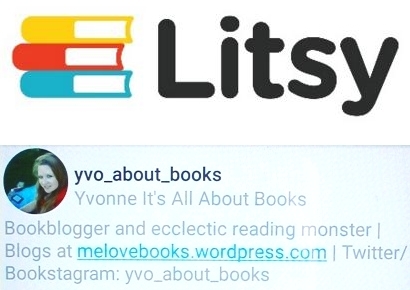 I had actually wrongly assumed One Of Us Is Lying was a contemporary romance read the first time I saw it and wasn’t sure it would be for me, so I didn’t add it to my wishlist straight away… So I guess I have to thank Ashley @ Socially Awkward Bookworm for putting this book on my radar with her review. 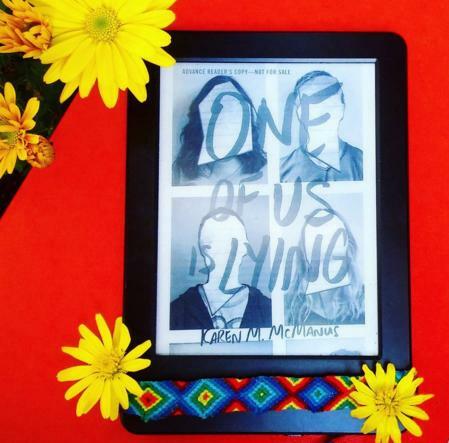 One Of Us Is Lying is without doubt one of the best YA mystery stories I’ve read so far this year. This is unreliable narrators and plot twists at its best; I did kind of guess part of the ending early on, but there is no way this story won’t at least partly surprise you. The story starts out strong and it sets the tone for the rest of the story. The main characters start out as high school cliches, but as you continue reading they slowly start to evolve and their development is very well executed. Despite the cliches it’s really easy to connect to the four suspects and they are one of the reasons this story works so well. My favorites would be Cooper and Bronwyn, but all four have their charm. The plot twists are excellent and definitely make you wonder what is true and who is lying; the ending wasn’t a complete surprise but was still satisfying. If you like the genre and you’re up for a healthy dose of high school secrets and excellent twists, One Of Us Is Lying is the book for you! 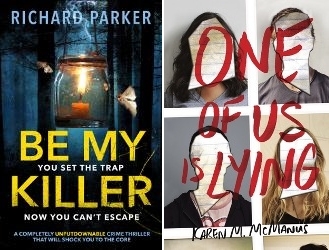 I’m currently reading another psychological thriller ARC and Bookouture read: Be My Killer by Richard Parker. And as things are going, I’ll probably be finishing it later today because I’m flying through this story! 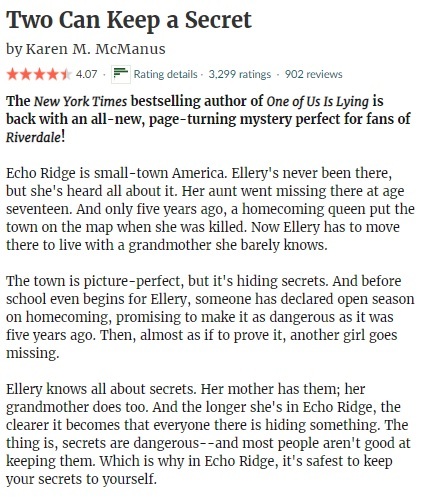 I’m also just about to pick up my copy of One Of Us Is Lying by Karen M. McManus; another ARC I requested after a recommendation and a title I’m really looking forward to. While not as strong or twisted as the first book, I still very much enjoyed Roses Of May. Especially the final part had a very fast pace and the writing style is very enjoyable to read. The serial killer and plot itself are both intriguing and the chapters with the killer’s thoughts added another level of suspense. I also might or might not have squealed when I saw my name mentioned in the story (doesn’t happen often, trust me!). The plot twists are interesting as well, although I did find out the killer’s identity early on. Without doubt still recommended though! Liar turned out to be another excellent psychological thriller read full of surprises. I found myself literally flying through the pages as I kept wondering about the chapter the story started with… Because Liar both started and ended with a bang. This is unreliable narrating at its best, and I loved every single minute of the ride. More than recommended for fans of the genre! I really wanted to enjoy this one and I still love the cover, but unfortunately I just couldn’t. I felt like it was as if I were reading in a foreign language I could only barely understand for most of the ride and I had a REALLY hard time finishing this one. In fact, I would probably have DNFed it if it wouldn’t have been an ARC. A little note: after some investigation, I found out this is actually a sequel and it becomes clear as you are reading Aurabel that a lot of both background AND essential information is missing if you don’t read the first book. That said, I don’t think this story has convinced me enough to actually try and read the first book. Unfortunately it ended up being a quite painful experience reading Aurabel. I have been wanting to pick up this collection of short stories about different characters dealing with the consequences of manipulators for a long time now, especially since I’ve seen various glowing reviews in the past. And I’m definitely glad I finally picked it up, because I really enjoyed reading them. Every story deals with a different angle and the stories are truly fascinating. My favorite story would be between the second and the third story; my least favorite probably either number four or five, but this doesn’t mean they were still good. If psychology fascinated you or you enjoy realistic fiction in general, Manipulated Lives is definitely a great read. It’s basically a miracle I could even see the cover of this one with all the dust it has collected for years… I’m glad I finally picked it up! Stardust is one of those exceptions where I have actually seen the movie first, something I prefer not happening because it alters the reading experience. It’s probably what happened here as well, because I kept thinking of the movie as I were reading Stardust… And I think this is one of the rare cases where I actually enjoyed the movie better than the book. It’s an entertaining and well written fantasy read, but it reads a bit slow and not as good as my Neil Gaiman favorites. After my recent Bookouture thriller request binge (five in one week and I’m not even sorry! ), I urgently need to read more NG ARCs to keep my ratio above 80% (yes, somehow I never actually dived below that mark; don’t ask me how that miracle happened xD)… First up is another thriller and sequel I’ve been looking forward to: Secrets Of The Dead by Carol Wyer. 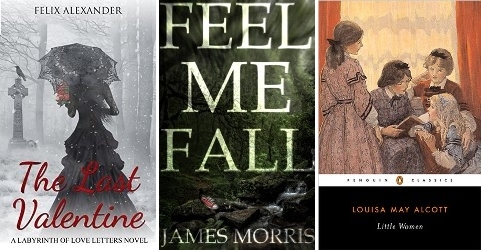 I also need to read Feel Me Fall by James Morris; I’ve read two of his previous stories in the past and enjoyed both, so I’m looking forward to it. The fantasy ARC Heartborn by Terry Maggert is also on my list… And I want to read And I Darken by Kiersten White ASAP so I can dive into my sequel ARC with time to spare. I can’t wait to finally read this series! I’m about to start Roses Of May by Dot Hutchison; another Netgalley ARC and a title I’ve been looking forward to. I read and loved The Butterfly Garden last year and I didn’t realize it was a series until I saw this sequel on NG… Can’t wait to dive into this disturbing story again! I also started reading Aurabel by Laura Dockrill, a NG fantasy ARC with mermaids, but I had to put it on hold after 5%. Why? I felt like I was reading a story written in a foreign language I could just barely understand. Things just didn’t make sense at all… And after investigating, this story apparently takes place in the same world as a previous book which I didn’t know about. That could probably explain the lack of worldbuilding, but does make it extremely difficult to properly enjoy it without reading that one first (which I don’t have time for xD ). * The first book I finished since last week is Anything For Her by Jack Jordan, which turned out to be an excellent psychological thriller and even better than his other title My Girl. It’s fast, it’s entertaining and it manages to catch your attention right from the first page… And the whole mystery around ‘that night’ is intriguing and definitely makes you want to keep on reading. More in my review. * I then read All The Good Things by Clare Fisher, another ARC I was really looking forward to. Unfortunately I ended up having mixed thoughts about it, mostly because I couldn’t connect to the main character Beth. Which is shame, because she’s a truly fascinating character and I really wanted to love this story. More about my mixed thoughts in my review. * I actually wasn’t going to continue this series after my experience with book three, but I gave in since already had a copy on my kindle and it would mean I could cross off another series. Unfortunately, The Murder Of An Angel by James Patterson & Maxine Paetro continued down the same road as book three, and the only reason I made it to the end is that the prose at least reads superfast. Want to know why I didn’t like it? Here‘s why. * After two mediocre reads, I decided to play it safe and pick up another Bookouture thriller. 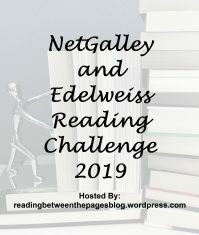 And I wasn’t wrong, because I’ve now added The Darkest Lies by Barbara Copperthwaite to the growing list of Bookouture winners. This story started out strong and stayed that way until the very end. Not every character is all that likeable, but you will forget all about that as you find yourself trapped in the same web of lies and secrets as the rest of the town. Many many plot twists and a surprising ending! 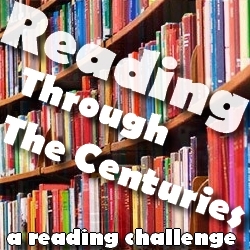 Find out more in my review which will be posted later today.